BY THE GHOST OF GRANT’S TOMB! 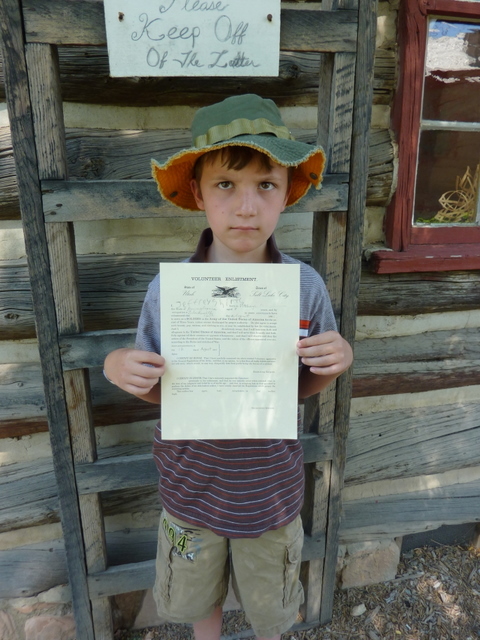 JEFFREY HAS ENLISTED IN THE UNION ARMY! 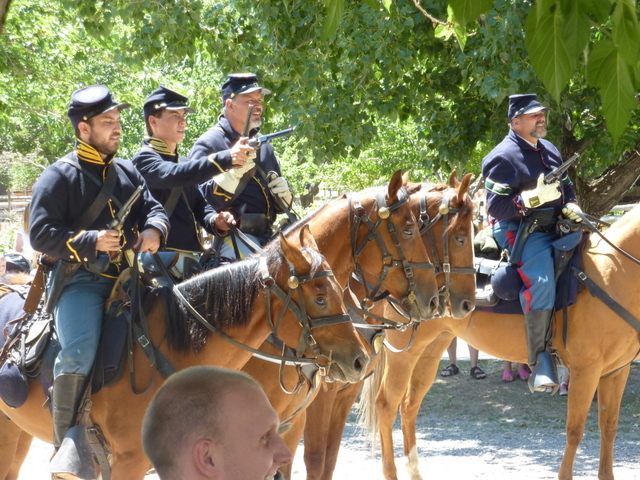 It was all part of “Voices of the Civil War” day at This is the Place Heritage Park. Jeff was in hog heaven. 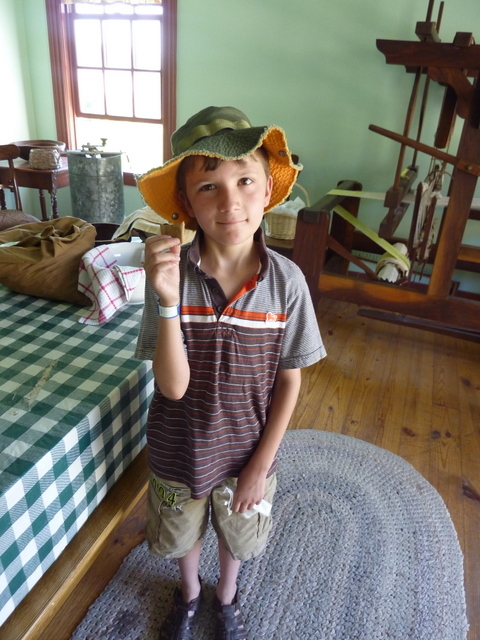 He got a gunny sack and a piece of hardtack . . . 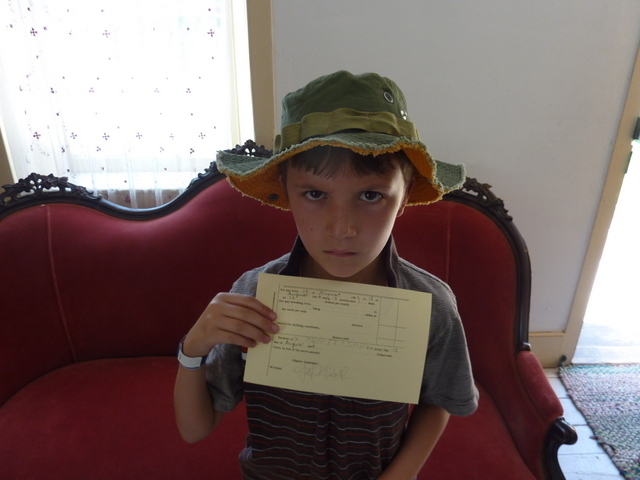 He later exchanged the stub for candy coins at the bank. Jeffrey was now official! Which was a good idea, because trouble was brewing on the main street. Some Union calvarymen were attacked by a ragtag group of Rebel infantry out on the main street. 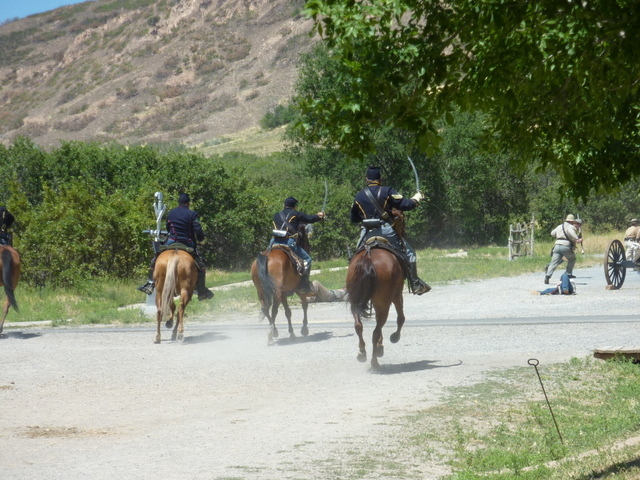 Shots were fired, and the Southern troops either dropped down dead or ran away. This was pretty much the opposite outcome of every single other Civil War recreation battle I ever saw in Virginia and Georgia. Down there, the Northern army is the one that runs away . . . usually into an abandoned barn . . . that then explodes into fireworks. So goes the War of Northern Aggression. As Jeff’s mother, I think my official job was to sob, throw myself melodramatically on the floor, and beg him not to go off and abandon his family to join the Army. At least, that’s what I’ve learned from really bad stage plays and period engravings. Jeffrey’s head was spinning by the end of the afternoon; he adored every minute. In some ways, Jeff is a kid born in the wrong time. After finishing all his recruitment-related activities, he saw a woman in period costume riding sidesaddle down the street. When she stopped at a corner, Jeff stepped up and doffed his hat to her. “Well, I am most glad to see that there are still a few fine gentlemen in this part of the world,” she replied. Jeff’s history face was INTENSE. Meanwhile, Eleanor spent almost all of her time doing PIONEER CHORES! Washboards, HUZZAH! Brian’s mother had come along with us on this busy afternoon, and she graciously offered to stay with William and Eleanor and watch them endlessly scrub rags and beat rugs. She’s a saint. The other skill Eleanor’s been picking up lately is photo posing. 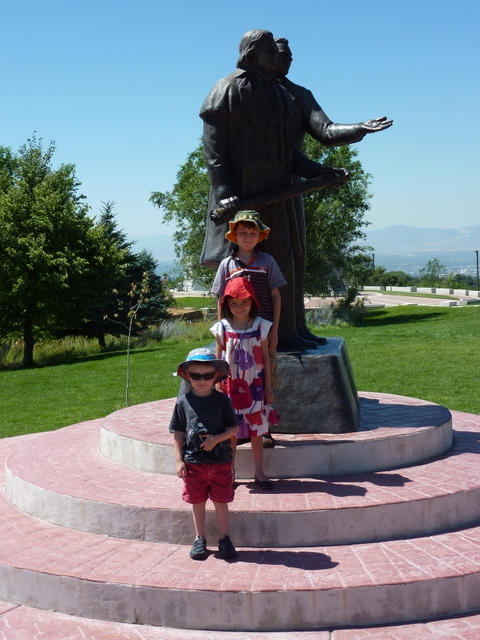 She took it upon herself to arrange her brothers in front of this statue, and then asked me to take the picture. Hilarious. 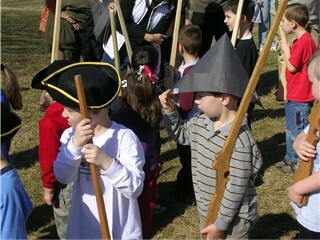 The best part, however, is that Jeffrey and the other children there were all able to join the Continental Army for the afternoon. This activity is done at Valley Forge on the 1st Saturday of every month, and it appeared to be done in conjunction with the local Boy Scouting organization. 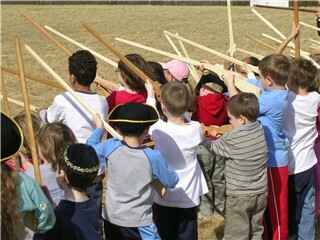 Kids were divided into groups by age, and given toy muskets to do drills with. 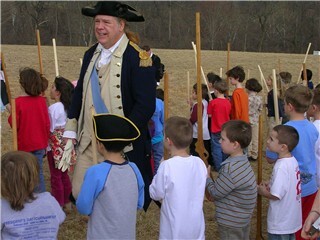 Batallion leaders in period uniform taught the kids to march and shoulder their firelocks in the right way. They were accompanied by a long tail of picture-snapping parents. When they reached the parade grounds, everybody “loaded” their muskets, attatched the “bayonets,” and then pointed them at an invisible enemy while screaming. HUZZAH! Kids were told up front that if they pointed their gun at another person, or poked or hit someone, it would be taken away. Jeffrey took this very seriously. 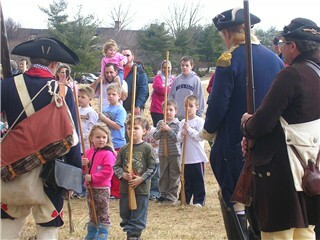 After drilling, General Washington did an inspection of the troops . . . 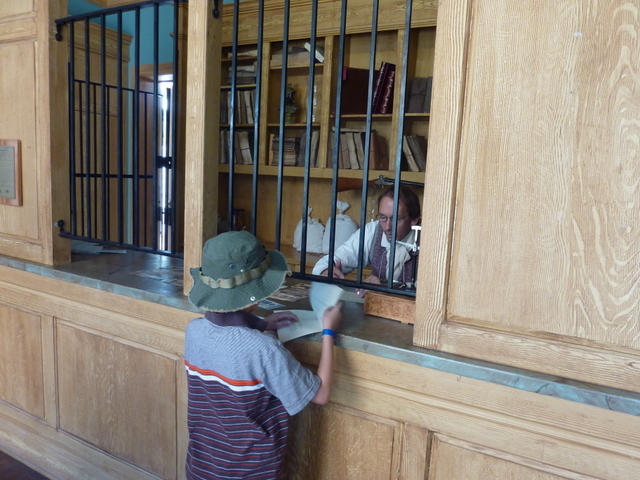 Kids who participate in this activity for 3 months get promoted to sergeant, and General Washington promotes them, and gives a little speech, and talks about “writing to Congress to ensure the proper payment of $12 per annum” or some such. 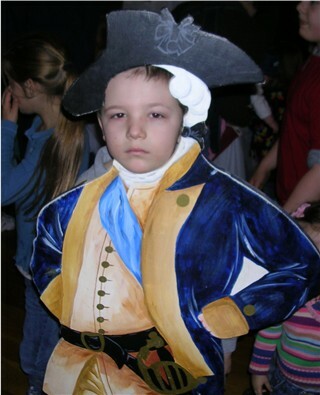 And keep in mind that he wasn’t just George — he was George in 1777. The man was probably a little too into his job; later I saw him pigeonholing people and giving long talks about threshing methods at Mount Vernon. George Washington’s Teeth by Deborah Chandra, illus. Brock Cole. Probably the most accessible book about Washington for preschoolers. A series of rhymed verses recount the loss, one by one, of Washington’s teeth during the major events of his life. Brock Cole’s detailed comic illustrations are gorgeous as usual. Oh, and get this: he apparently never wore wooden teeth.